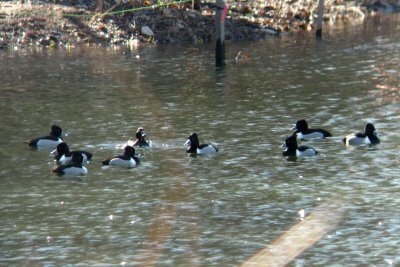 A group of 30 to 50 Ring-necked ducks have been at Echo Lake park from mid-February through March. This "odd" Mallard duck (white breast, brown body) has been at Nomhegan Park for many weeks. 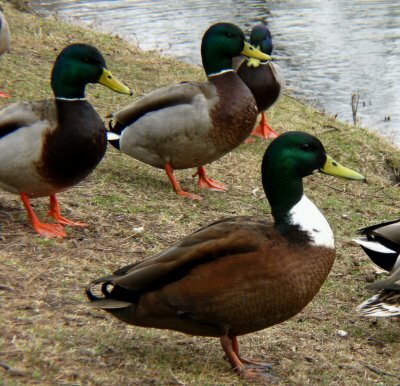 I've seen a few of those 'odd' mallards with white throats and brown bodies in both London and Dublin. If you're interested, you can see a photo of one here. In a domestic duck, that's called a bibbed duck. Could have occurred naturally or a domestic duck (mallard derivative) bred with a wild duck and the trait is now "out there". I just saw 4-6 of these last night on a bayou in Western Michigan. Interesting duck!